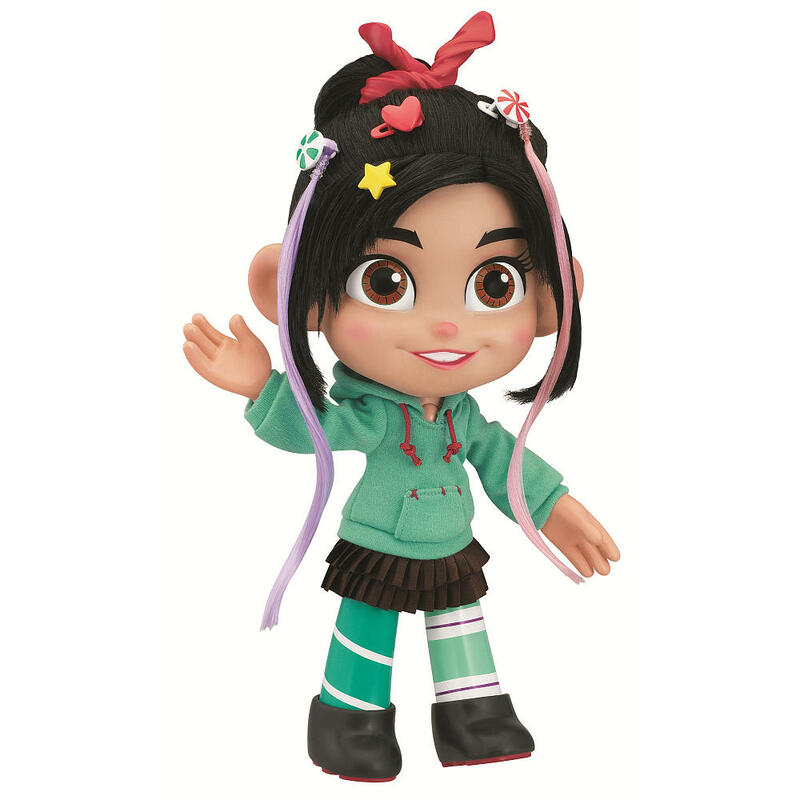 Tiny Review – Vanellope von Schweets talking doll! I will proudly admit that I am a huge fan of Wreck-it Ralph. I’m pretty sure that’s no surprise at all to anyone who follows my blog. 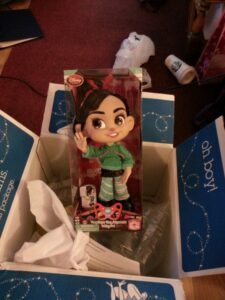 I’ve got quite a few Wreck-It Ralph figurines – there was a set of them I received as a holiday present from a close friend, and there’s a couple of Vanellope figures I picked up, and I’ve also got an awesome Wreck-It Ralph poster – and a Vanellope plush as well! I’m eagerly awaiting March 5th, when the DVD comes out – of course I’ve got it preordered. 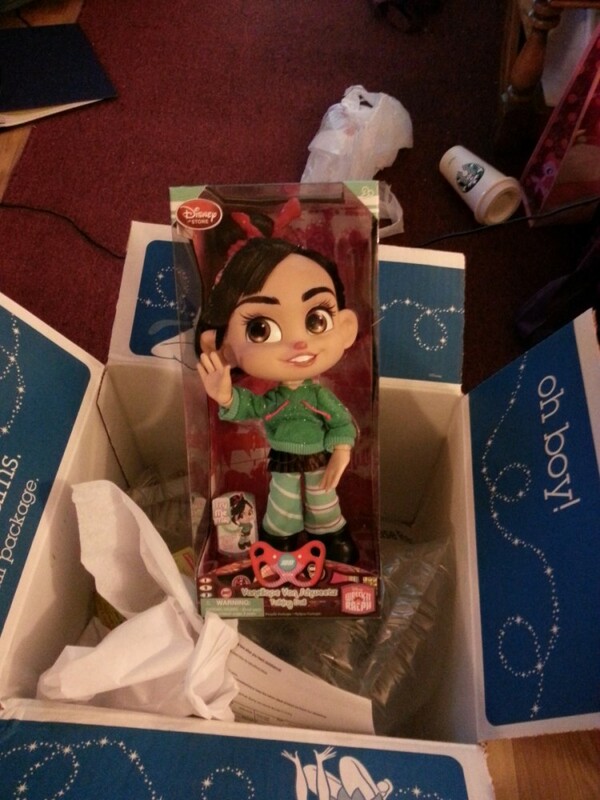 So, it shouldn’t be a surprise to anyone that when I found out Disney made a talking Vanellope von Schweets doll, I had to have one of my own. …she was $50.00. And talked a lot about getting her hair done, and had some ridiculous hair extensions. Granted, yeah, this was the Toys R Us version, and not the Disney Store version I’d initially been looking for, but I was definitely shocked by the $50 price tag. I’m not going to lie – I almost bought her, but realized $50 would also buy a lot of My Little Ponies, and talked myself out of the purchase at the time. I’m glad I did, because I found the version I was looking for on the Disney Store’s website, for half the price of the crazy hair-extension version, and I had a 25% off coupon too! So, I picked her up, because it was a lot easier for me to justify dropping $20 on a talking doll instead of $50. And on my sick day at home earlier this week, she came! She’s definitely nice and loud, as you can tell, and she says some of her catch phrases from the movie. (Bryan and I are a little disappointed that she didn’t make any doody jokes, though. Yes, we are apparently eternally 10 years old, haha.) She’s put together really well, and stands on her own pretty well too. She’s got a lot of styling product in her hair, though, and some parts of it are tied into place – I guess that’s to help it keep its style? I’ve got no idea. I do know, though, that I thoroughly enjoy this Vanellope doll, and I’m definitely glad I picked her up! If you collect Disney memorabilia, or loved Wreck-it Ralph, you should definitely get one for yourself – you won’t be disappointed!